This image was taken last month in the Pryor Mountains of Montana. 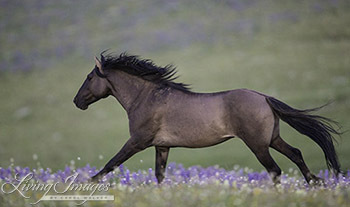 This gorgeous wild grulla colored stallion named Garay chases after another stallion in the early morning. The soft light picks up the gorgeous colors of the mountain lupine. This image was taken in May in southern France. 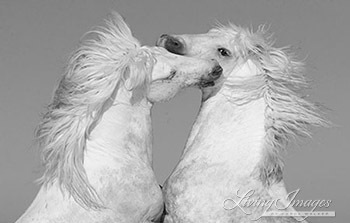 Two pure white Camargue stallions rear up while playing, and the use of black and white highlights the lines of their manes and long necks.